A nested record is a record within a record. Here you see a record (represented bei the outer square brackets), containing the two variables a and b, while a names an expression, which is a record itself. The environment for each sub-expression is formed by all the variables belonging to its parent-expression, except itself, and all the variables within the environment of the parent-expression. Let’s make this more plastic: In this example a and b are in the same environment, which is the outer record. Records are structured data, and all variables of the same structural level are in the same environment. The variables x, y and z name the sub-expression of the parent-expression a (the record itself). Each of these variables can access the other variables within their record (as we already know from the last post), except themself. 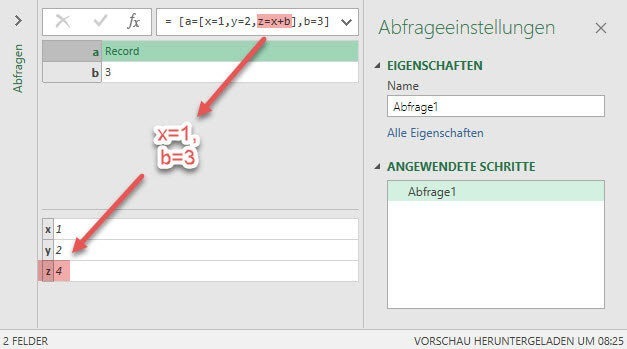 New from here is, that x, y and z can also access b, because b is part of the environment of a, which is the parent-expression of x, y and z. When x is refered from inside record a, the inner x is used. Inner means, we are looking from the perspective of the record a. Inner and outer always depends on the perspective you have taken. We’re looking from the perspective of record a. In this example we’re referring to x from outside record a. 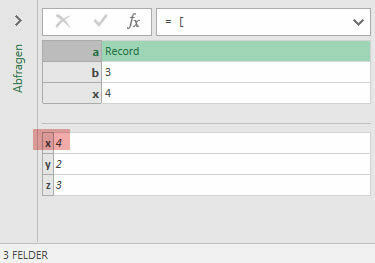 In this example x is refered from inside record a, again. But this time it is refered from the inner x. How can this behavior be explained? When the environments of x, y and z within record a are formed, the following happens: The environment of each variable (x, y and z) gets merged with all the variables existing in the environment of parent-expression a (which is b and x). This leads to a conflict, because when merging these environments, x exists twice, what is not possible. Remember: Variables have to be unique in their environment, because they work as identifiers for their specific expression. When we refered to x from x inside record a (a[x] = x), another rule kicked in (read about it here), which says, that a variable is not part of its own environment, so that the outer x is the closest x. In addition to record, also let expression create their own environment. Let’s have a look at this topic too. Let expressions define one or more expressions after the let, and return a value, which is calculated by the expression after the in. Regarding environments, the only important information for you is, that the expression after the in, can access all the variables defined in the let expression, because they belong to its environment. All these variables are merged, to form the environment of the specific variable. This can lead to conflicts, as variables can occur multiple times in different environments. This conflict is resolved by always using the variable, that is closest to the expression, that refers to it. Let expressions: The expressions after the in can access all the variables defined in the let expression, because they belong to its environment. Very interesting, I was wondering though, if it is at all possible to reference the „outer x“ within „a“ or is the inner x basically replacing the outer x when there is a name conflict? The @ allows recursion, which in this example means to be able to call the record from inside the record itself. I learnd this from Igor Cotruta. If you want to dive deeper into it, take a look at chapter 6.3 in the Power Query language specification. 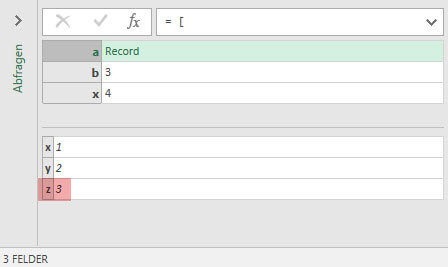 I don’t know if Power Query supports deep references, similar to other functional languages (like r with <<- assignment operator). But I do have a workaround for this. How meta is that 🙂 ? Thanks Igor. That also applies to your posts. There will come more soon.